Roshni Ghar is a community development mental health organisation based in Keighley that works predominantly with women from South Asian backgrounds. The Excellence in Public Health and Wellbeing 2016 celebration event honoured unsung heroes from across England who are leading local initiatives to improve the nation’s health and wellbeing. 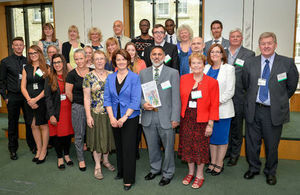 The celebration, on Tuesday 28 June at Portcullis House in London, was an opportunity to recognise the people who go above and beyond to make local schemes and initiatives a success. In all, 82 nominations were received from across the country, 33 of which were selected to receive special recognition at the event. It was a great privilege to meet this years’ Public Health Heroes at the celebration event and hear how they are tackling important health challenges in their communities. Their vital work is often undertaken quietly and without recognition so it was wonderful to have the opportunity to celebrate their achievements.